We have a grapefruit tree in our yard that produces a decent crop each winter. I've used it to make grapefruit liqueur for the past few years but recently I had the urge to make a big batch of grapefruit wine. The tree appears to have enough fruit for five gallons but some of them would most likely be out of reach, even with my extendable fruit picker. Fortunately, I spotted another tree reaching over a fence a few blocks down the street, with enough fruit to fill a truck. While a couple of dogs frantically alerted the neighborhood to our presence, Jed and I hastily scored 30 grapefruits and made off with our plunder. The grapefruit had a surprising amount of black grime on top, probably from the heavy LA smog. They had to be scrubbed with a vegetable brush under running water to remove it. After cleaning the fruit, I started zesting them. I added the zest of 10 grapefruits to a nylon mesh bag stretched over the mouth of the primary. I zested a few others and threw that in a glass jar to be made into grapefruit liqueur later. Meanwhile, Jed chopped up all the golden raisins and added them to the nylon bag. We then juiced the fruit into the primary with a hand-held orange squeezer. The grapefruit halves didn't fit very well but that was the largest tool I had. I don't like the juicers that require you to grind the fruit by hand because they get clogged quickly. My potato ricer would have been another good option but it's quicker and easier to wipe the pulp out of the orange squeezer. When preparing large volumes of fruit, speed is a priority. I scraped the leftover pulp into the bag with a spoon and loosely tied the bag shut. We boiled a 4 lb. bag of sugar in some spring water and added that to the primary, followed by enough water to make five gallons. That's five gallons of liquid alone--once the bag was submerged it displaced about a gallon of the must. Always buy a primary with plenty of headroom. The one in the picture holds six gallons, with some room to spare. I mixed the Campden tablet, tannin, and yeast nutrient into a vile, brown cocktail and stirred that into the must thoroughly. 12 hours later, I dissolved some pectic enzyme in water and stirred that thoroughly into the must. Pectic enzyme has a tendency to clump up when introduced to a liquid so I always mix it in a small glass of water first, until it is completely dissolved, then add it to the must. The pH was now 3.4 and the specific gravity 1.062. That translates into 8% potential alcohol, which is low for a wine, but the original recipe recommends step feeding sugar to the yeast. The reason for this, which I learned the hard way while making a high gravity bochet, is that too much sugar acts as a preservative and hinders yeast activity. If you add it in increments, the yeast can multiply more rapidly during their initial stage of life. After another 12 hours I created a yeast starter. The original recipe called for Sauterne yeast but our local home brew store doesn't carry that. In fact, I haven't been able to find it on the internet, either. Several winemaking forums suggested Côte des Blancs as a substitute but I didn't have any stocked in the refrigerator. I was thinking of using the ever-reliable EC-1118 but Jed advised against it, reasoning that the grapefruit would already lend a bitter component to the wine and this would probably not pair well with the ethanol bite of an 18% strain on top of that. We settled for Red Star Pasteur Champagne yeast, with a more modest alcohol toxicity of 13-15%. By the next morning, fermentation was underway, albeit slowly. The bag was now floating, so I pushed it underwater once in the morning and again at night. The fermentation is vigorous now, and loud enough to hear outside of the primary. In the morning, the hydrometer showed a difference of 0.003, which isn't much but I'm sure it will accelerate in the days to come. I punched down the cap twice during the day. In the evening I boiled the remaining sugar (4¾ lbs) in 4 cups of spring water and set it aside to cool. By evening, the hydrometer read 1.042, indicating a net difference of 0.020. Once the sugar syrup had cooled, we poured a small amount of it into the primary and it fizzed up like a shaken soda bottle! We kept adding sugar in increments, measuring the gravity each time. We were aiming for 13% (the alcohol toxicity of Pasteur Champagne), which would have equated to 1.098 on the hydrometer. Subtracting the 0.020 that had already fermented, that made our target 1.078. Unfortunately, the sugar syrup only brought the gravity to a little over 1.070 and we had used up all the sugar in the kitchen. This new gravity translated into 12% potential alcohol, which wasn't too shabby, so we stuck with that. With the added volume, the tip of the airlock was now submerged, and before long must was being forced into the airlock from the incredibly strong fermentation. There was absolutely no chance of anything making its way into the primary, so I decided to deal with it in the morning. When I bought this primary, the lid had no hole so the guy at the home brew store drilled one big enough for a bung to be wedged into it. With the bung inserted from the top, the tip of the airlock rested so low that it was submerged and ended up forcefully ejecting the must. The lid was actually buckling from the pressure within! I removed it, sanitized everything, and pushed the bung up from underneath the lid. This allowed the airlock tip to clear the surface and freely expel CO2. As I said in an earlier post, always keep ample headspace in the primary. The specific gravity is now 1.062 and so far, it tastes great. Now I understand why so many of Jack Keller's recipes add half of the sugar in the beginning and the other half a few days later. The yeast is unstoppable now! This morning the gravity was 1.040 and by evening it was 1.032, so I guess that's roughly 7.8% ABV. The sugar content has noticeably diminished, allowing the the bitter, aromatic characteristics of the grapefruit to come to the forefront. The flavor of a finished fruit wine often bears only a distant resemblance to the fresh and juicy qualities of its source ingredients, which may come as a surprise to the novice winemaker, but I think this batch will still taste unmistakeably like grapefruit, thanks to the citrus oils in the skin. Specific gravity: 1.013. With this much sugar removed, it tastes much more like an actual grapefruit, except with 9.8% alcohol. It leaves that characteristic bitter, numbing sensation on the tongue. Specific gravity: 0.998 (12.3% ABV). We've reached our target ABV but it's still fermenting. The ABV may climb slightly higher by the time the wine falls still. I was busy this month so I didn't get around to racking this into a secondary until today. The wine has clarified quite a bit in the meantime. Hopefully, there won't be any adverse effects from sitting in the primary so long. It has darkened in color and turned slightly brown, probably from low sulfite content. I drip-drained the bag of pulp and racked the wine into the secondary. Since the primary was so full I was able to finish racking well before I reached the lees, leaving behind a good couple of inches of wine. I dumped it down the sink, which struck Jed's brother as wasteful, though he wasn't interested in taking it home with him. The wine is clear, with compact lees. I racked it into a new carboy and topped up with a solution of sulfite and stabilizer. The package of sodium benzoate indicates a dosage of 1/4 tsp per 6 gallons, so to adjust for 5 gallons, I added dissolved a 1/4 tsp in a cup of water, then poured out 1/6 cup of the solution and added 5 crushed Campden tablets. I racked the wine into a new carboy. There was not much sediment at the bottom this time. 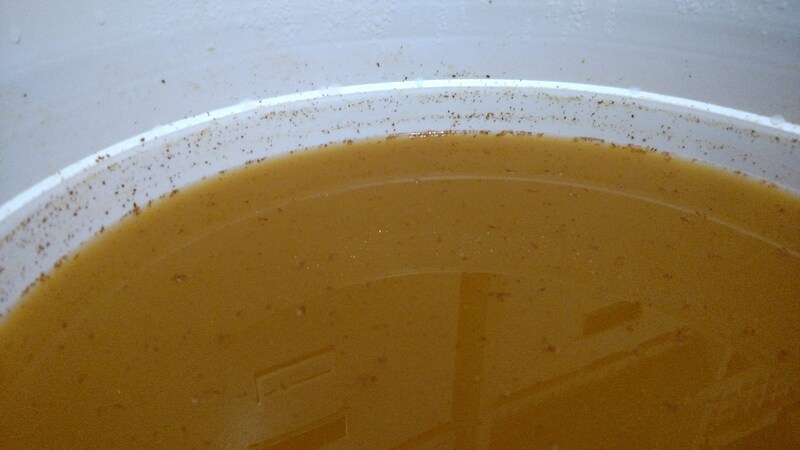 Despite the bulk wine appearing somewhat brown or orange inside the carboy, the sample I drew into a glass was a more appropriate golden yellow color. I topped it off with some Moscato since I ultimately plan to sweeten it and the wine is already stabilized. I added a splash of Moscato to the sample in the glass and it tastes great--there is no question what flavor of wine this is. Since I was adding lysozyme to the fig wine, I figured I'd add some to the other wines that are currently bulk aging. An ounce of prevention is worth a pound of cure, especially in winemaking. Of course, I sampled a bit with the wine theif. This is delicious! It's very dry and tart, and tastes unmistakably like a grapefruit. Of course, there is a significant portion of the world that detests grapefruit, so this is not for everybody. Oh well, their loss. I love it. I was already fining our loquat wine with kieselsol and chitosan so I figured I'd do the same with the pomegranate wine while I was at it. The grapefruit wine was crystal clear already after the lysozyme addition but I figured some extra fining wouldn't hurt. I drew off 7.5 ml of kieselsol with a syringe and added it to the wine, stirring it with a sanitized racking cane. An hour later, I added 30 ml of chitosan and stirred that. Of course, I tasted a sample beforehand and it was delicous. This one's a winner. We ran the grapefruit wine through the Mini Jet filter, using the coarse pads and then the polishing pads. The change in clarity wasn't as drastic as I'd expected but at least using the filter means there will be no sediment in the bottle, even after a year.